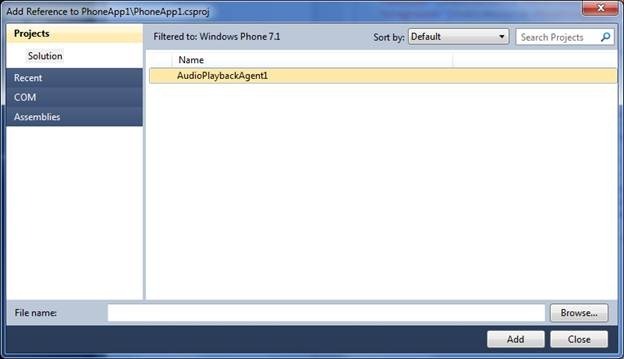 In this post, I will walkthrough to “Play Background Audio “in Mango or Window 7.1 phone. This post is fully based on Beta version. In this post, I will show how to play local media. 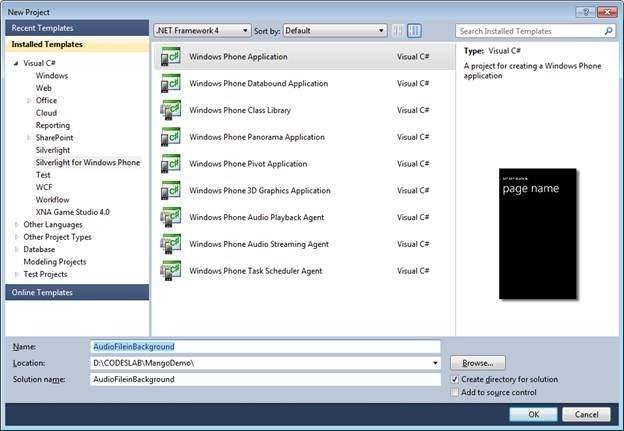 First let us create Windows Phone Application. 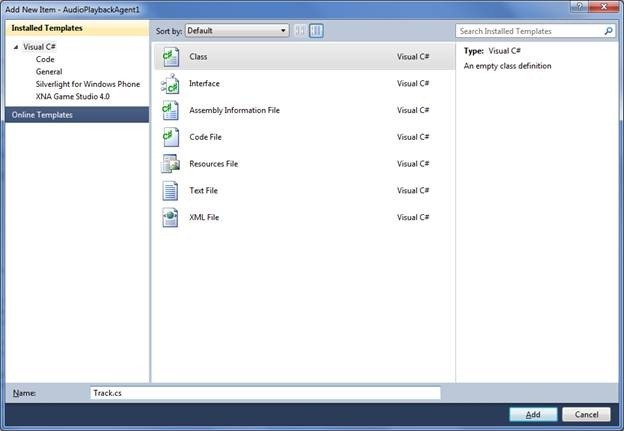 To create, Open Visual Studio and select Windows Phone Application from installed template. 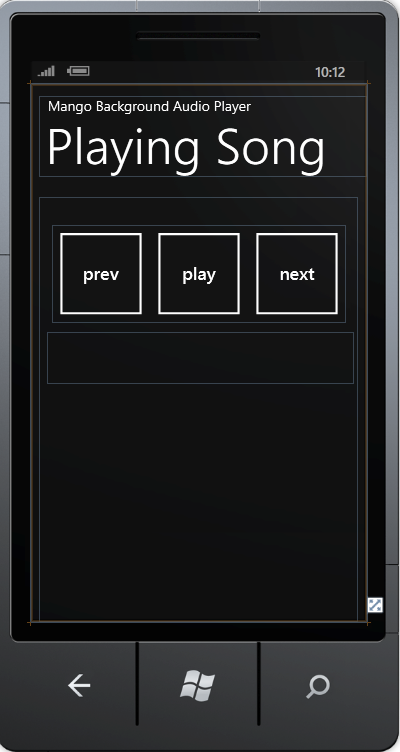 Next step we need to do is to add a project for Audio Playback Agent. 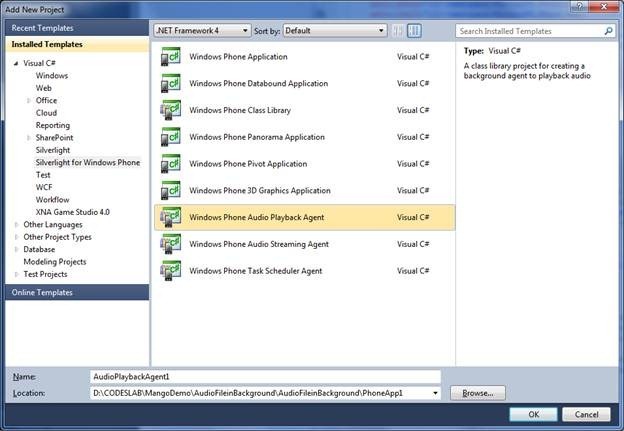 So right click to the solution and Add new project and from installed templates select Windows Phone Audio Playback Agent project type. 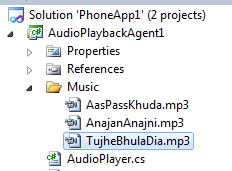 Since both the projects have been created, now add few music files to play. 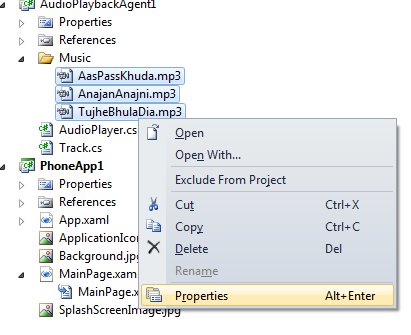 To do this right clicks on AudioPlaybackAgent project and new folder. Give desired name to this folder. In this case, I am naming newly created folder as Music. Right click on Music folder and add existing items. Add music files to this folder. By now, music resources are added. 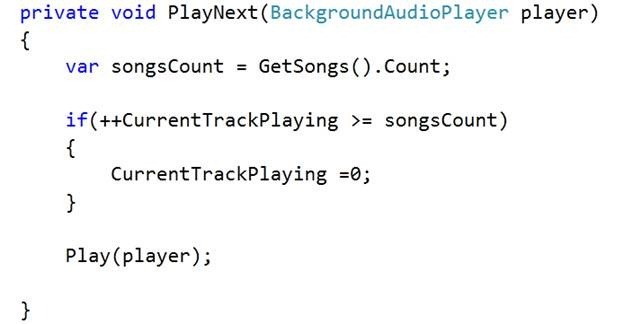 Now you need to create a representation class for the songs tracks. 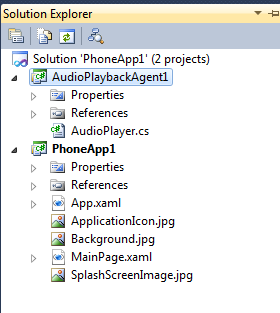 Right click on AudioPlaybackAgent project and add a class. Give a desired name . Let us add required functionalities or modify default functionalities to perform various operations on Audio file. Above function is returning List of Tracks. 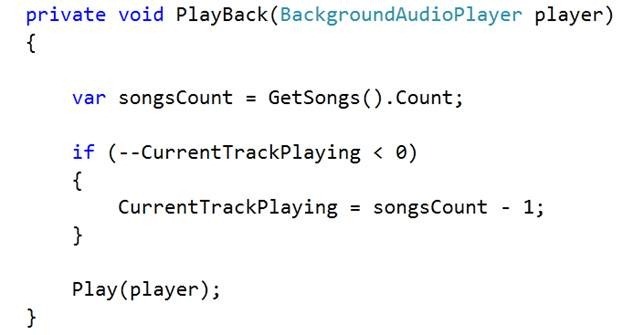 Now we need to add a function to play a song. 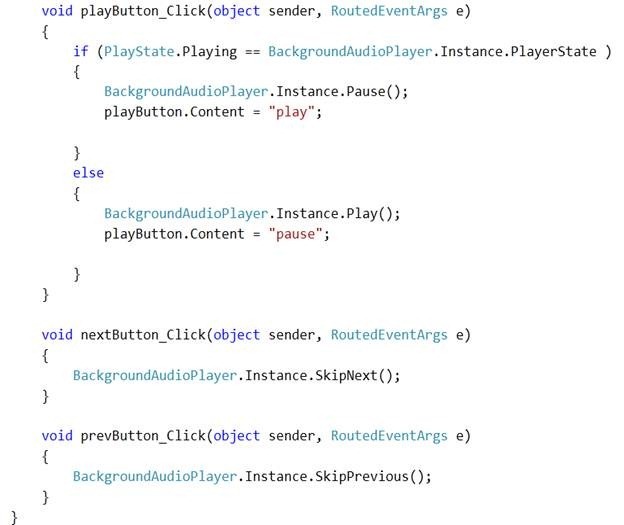 Create a function called Play. Create a Track to play. As parameter you need to pass Source of the track, title, artist and album name. 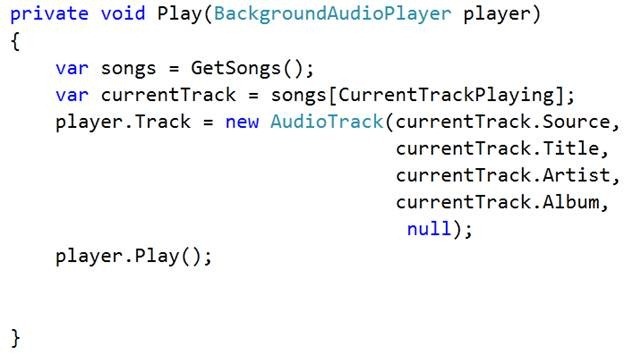 After creation of Track call Play () method on object of BackgroundAudioPlayer. To play next song we need to track the current track record and increase it by 1. 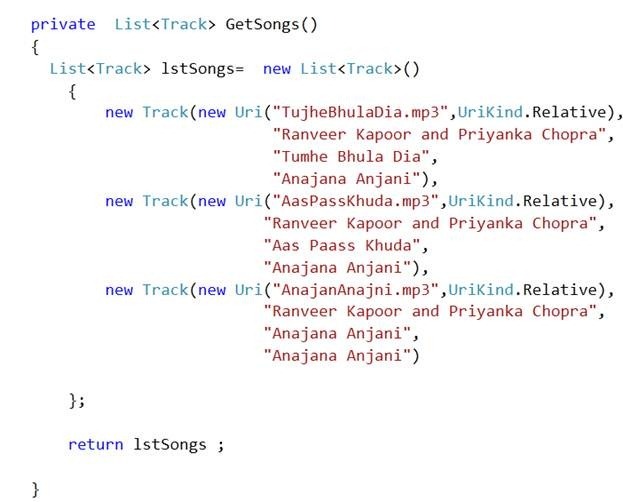 Once it is equal to total number of songs in list reinitialized it to 0. To play previous song we need to track the current track record and decrease it by 1. Once it is less than 0 then reinitialized it to maximum number of song in list. We need to handle user actions like Play, Stop, and Pause etc. For that you need to modify overridden function onUserAction . Add below switch case in onUserAction method. 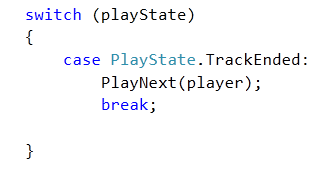 To handle Play state changes add below switch case in OnPlayStateChanged() overwritten method. /// <param name="param">The data associated with the requested action. /// itself has an unhandled exception, it won't get called back to handle its own errors. And click event for three buttons would be fairly straight forward. 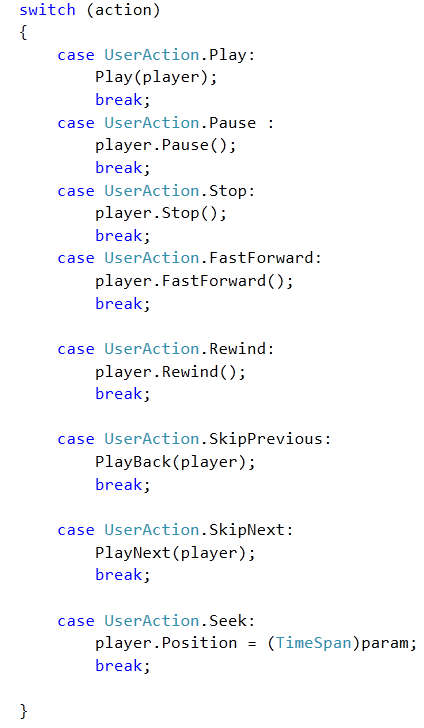 We need only to call SkipNext , SkipPrevious methods on instance of BackgroundAudioPlayer. First you need to register an event in the constructor of MainPage class. 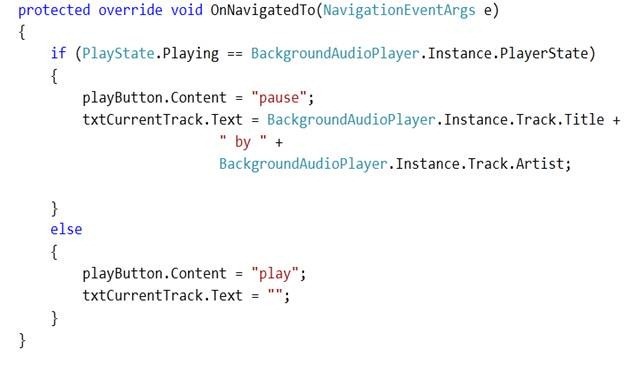 This event would check if playing track is not null then would display information in the text block. Since audio would be playing in the background so when user will navigate should be displayed with meaningful information. For that you need to override OnNavigatedTo virtual method. Folder name is exactly the same. Sequence of File names in string array files is exactly the same as you are returning from GetSongs() method. 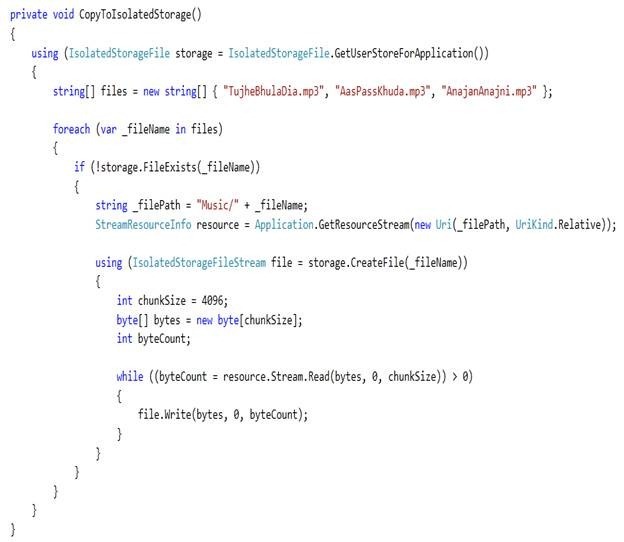 Call this function in constructor of App class. Now you have created a background music player. Press F5 to run the application. 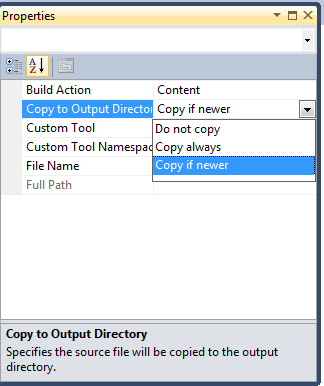 I have one doubt regarding OS 1.1 development Framework .Sir I am using VS 2010 Ultimate Version.But The Released Version OS7.1 Toolkit for developing (MANGO)apps is for VS 2010 SP1?? Is it so ? Is it support only MP3 format ?